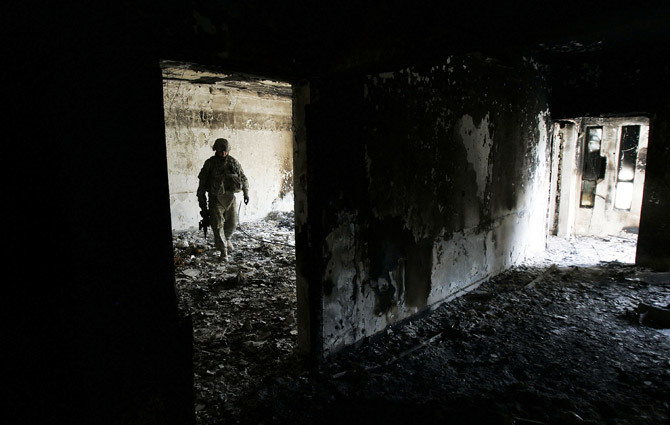 An American soldier with the 1st Cavalry Division walks through a home torched by militants February 15, 2007 in the mixed ethnic neighborhood of Gazaliyah in Baghdad, Iraq. The silence is eerie. After opening the U.S. Army's first combat outpost (COP) in Baghdad last month the men of Charlie Company, 2-12 Cavalry, had gotten used to gunfights raging nearby, the crack of bullets passing overhead, and the explosion of rocket-propelled grenades. After all, this was Ghazaliyah, where Sunni insurgents and Shi'a militiamen have battled each other, the Iraqi army and police, and the Americans for months. In the past week, though, the men have been unnerved by absence of the sounds of war. "It's been quiet  really, really, quiet," said Sgt. Sergej Michaud, 24. Michaud has cropped his dark hair nearly to the scalp, and he has a tattoo of a helmeted skull on his left forearm with TANKER printed below. Like many other soldiers at the COP he relishes the chance to drive towards gunfire and separate the combatants in Iraq's sectarian war. That was routine for his platoon until a few days ago, when the violence suddenly dropped almost to nothing. One soldier said he used to doze off at night by imagining the gunfire was the sound of rain on a tin roof. Now the nights are virtually silent. That's unusual for any Baghdad neighborhood, and eerie for a notoriously violent place like Ghazaliyah. Gunfights with insurgents and militiamen worry Sgt. Michaud less than figuring out where those enemies have gone. "I have no idea," he said. "It's kind of scary. It's kind of scary." In Ghazaliyah, northeast of Baghdad's airport, Iraq's savage and complex civil war has been playing out in miniature. Moqtada al-Sadr's Mahdi Army militia has been encroaching from Shula, the Shi'a-dominated neighborhood to the north. The Sunni minority has virtually vanished from northern Gazaliyah, driven away by murder and intimidation. In the heavily Sunni southern part of the neighborhood homegrown insurgents and foreign jihadists have been attacking the Americans and Shi'a-dominated security forces. The COP is a short drive from the road that serves as a dividing line between Ghazaliyah's Sunni and Shi'a communities. Moved from its home at Camp Liberty, one of the bases within the sprawling American compound at the airport, Charlie Company fortified a row of houses with concrete, razor wire and plenty of firepower. The COP is the first test of the counter-insurgency strategy the military plans to implement across Baghdad. Part of the plan hinges on quicker response time and constant interactions with residents. The thinking goes: with no room to fight and fewer chances to intimidate civilians, the power and influence of militiamen and insurgents will wane. Until this week, though, the war in Ghazaliyah continued to rage even with Americans in the middle of it. "At least twice, three times a day, every day," said Sgt. Jason McQueen, there were "straight-up gunfights all around you." But now, said 1st Lt. Jake Furda, 26, "the biggest question of everyone's mind is, 'where the hell are they?'" Part of the explanation, said Capt. Erik Peterson, may be the Mahdi Army's plan to lie low and deny the Americans targets for their operations. But the 29-year-old company commander said that didn't explain a similar decline in activity by Sunni insurgents. He said Charlie Company had recently conducted raids against Mahdi Army targets and clearing operations against Sunni insurgents. Several members of the company said they had just completed an operation in which they captured Sunni insurgents, including several sniper teams. Still, it is unlikely that those operations alone could have blunted the Mahdi army and the Sunni insurgency in Ghazaliyah. Now Peterson's question is: "Do I think they're regrouping for an attack, or are they having issues with combat power?" In either case he and his company are hoping to exploit the situation. "This is a great opportunity to drive a wedge between the militia and the general population." Meanwhile the militia and the insurgents have been finding ways to operate under the radar and out of firing range. On the streets of Ghazaliyah, Sgt. Michaud said, the Mahdi Army continued to "slowly, but surely," force Sunnis from their homes through other forms of intimidation. The more immediate threat, though, may be a spectacular Sunni insurgent attack designed to show residents in Ghazaliyah that their power has not been blunted. "If I'm the enemy, I've lost the initiative," Peterson said. "I've got to do something big and visual." An attack on the COP would send a powerful message, and Charlie Company has redoubled its effort to secure the compound. On Wednesday night a platoon sergeant taped "CCP" in giant red letters to a wall in one of the COP's main rooms. "CCP" indicates a casualty collection point, where wounded soldiers would be gathered for treatment and possible evacuation. "I think I'm a big, fat target right now," Peterson said.